The H&R Staff weigh in who will be the starting 5 for next season. Haarms - C - The team’s top returning scorer. He’s going to have an even larger role, but he has grown into it. Nojel - PG - Can someone buy him a jump shot on eBay? Wheeler - SF - My goodness, I am excited to see him with another year. He is my candidate to make The Leap. Sasha - SG - Needs to be the next Cline/Mathias, but if he is we’re set at this spot for three years. Trevion - PF - He’s gonna drops 25 pounds and dominate. Carsen leaves a big hole in the lineup. Full stop. But, the team has to go on and with the loss of two seniors it makes things look dicey starting lineup wise. 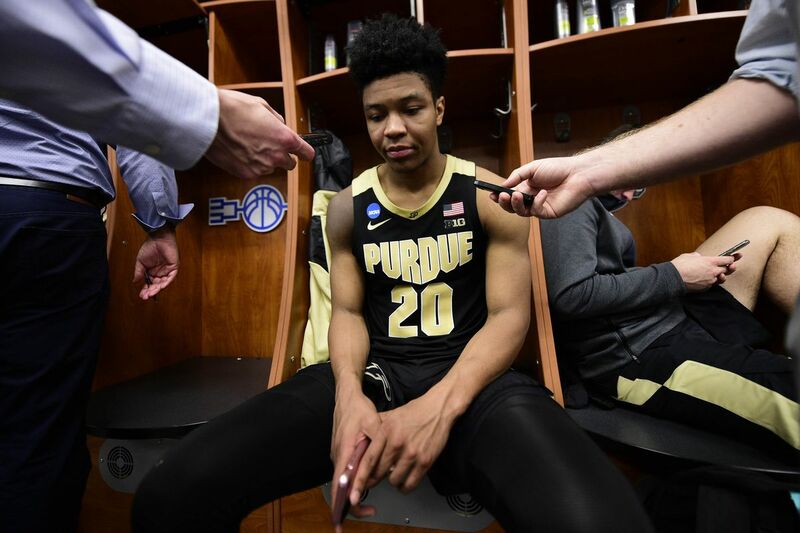 Sure, Purdue replaced four senior starters for this season and ultimately won the conference and got to the Elite Eight but how often can a team and coach truly reload like that? It’s not easy. Point guard is the easiest because it’s Eastern. He’s earned the floor general spot and will continue to improve both his free throw shooting and jump shooting to make himself more dangerous on the offensive end. Haarms has earned his starting spot back after the way he finished the regular season on fire while starting. He mentioned earlier in the season that he often tried to do too much when he started games which caused trouble for him. With those nerves hopefully out of the way Purdue has both the 1 and the 5 locked in. After this it gets tricky. I’ll say that Sasha takes Cline starting spot just for sheer interchangeability factor. Sasha isn’t near as good as Cline but he can get there and he showed great hustle this year. Assuming he can cut down on the fouls he’ll have a great shot at a lot of minutes. Wheeler is my candidate for player who takes the biggest leap in the offseason. The guy is incredibly talented. You saw it in flashes as the season progressed but once he gets placed into a starting role next year he’s going to be difficult for teams to stop. The last spot is difficult for me to decide on. I never like to put incoming players in starting roles because quite frankly I don’t know anything about recruiting and gun to my head I couldn’t get all of their names out and accurately. With that in mind I’ll place Hunter in my fifth spot since he acquitted himself well in the first round of the tournament and with some improvement in his shooting he could be nipping at Wheeler’s heels. Guard: Eastern - Eastern will be our most versatile player next season. He will defend the other team’s best player, he will initiate the offense and will be a leader. I saw his leadership sky rocket this season in comparison to his freshman year. If he finds his jump shot this summer - look out. Guard: Newman - The 78th best player in the 2019 class will be a starter in my books. He is the closest thing we have had to Smooge, since Smooge. He is 6-4 and is wirery as hell. He will have a great career at Purdue, starting with his freshman year, where he will be a first team all frosh in the Big Ten. Forward: Stefanovic - We need court spacers, especially with our point guard not being able to truly shoot the three ball. Sasha is an efficient shooter and he will do the little things right on the defensive end of the court. He is the same mold of Mathias and Cline, great shooters and will turn into solid defenders with their basketball IQ and hard work. Forward: Wheeler - Wheeler, who will be our next NBA player, might be the best player on the team. The TO BE sophomore was solid off of the bench this season. At 6-9/6-10, he is long, athletic and wirery. He can shoot the three and defend the rim. He will make the biggest jump this season. Center: Haarms - I believe Haarms will retain his starting center position that he took back from Williams in the middle part of the season. Haarms has shown he can make a jump shot, even a few threes. His jump shots will get more consistent and those slips to the rim will turn into pick and pops. He will be deadly. Purdue Basketball: Coach Painter in the Grad Transfer Market, Again Coach Painter is looking to fill a huge hole, to the Grad Transfer Market we go. B1G Basketball Opponents Announced Both Purdue basketball teams found out who they will play in conference play next season. Purdue Football: Biggest Questions Heading Into Fall Camp - Quarterback Drew takes a look at a few crucial questions facing the Boilermaker offense in fall camp, starting with quarterback.